This is another family favorite that is great year round. You could vary it by adding a thin slice of prosciutto on top of the chicken and under the spinach. I would serve this dish on top of soft polenta, or with garlic mashed potatoes on the side. This is another family favorite that is great year round. You could vary it by adding a thin slice of prosciutto on top of the chicken and under the spinach. Rinse the spinach in water, dry and coarsely chop. Place the spinach in a medium saucepan with 2 tablespoons of the oil and cook until it is wilted, remove from the heat and season with salt and pepper. Pound the chicken breasts until they are an even thickness of about 3/4 inches. Season the flour with salt and pepper, and dredge the chicken breasts into this mixture until they are lightly coated. In a large frying pan that will hold all of the chicken breasts, heat the remaining oil until hot. Cook the chicken breasts until they are browned on each side, about 3-4 minutes per side. 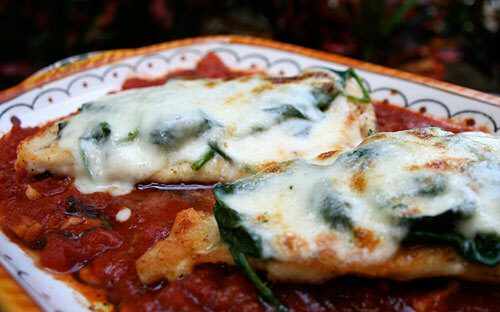 Top the chicken with the reserved spinach, dividing evenly, and then top each with a slice of mozzarella. Carefully pour the tomato sauce into the skillet around the meat, being careful not to cover it. Cook uncovered over medium heat until bubbling, and then reduce the heat and simmer about 8 minutes more.